My Sister and I have had the privilege of always getting our purchases on time and in perfect condition. This time, however, our new chandelier arrived broken. We immediately contacted Overstock and we can’t be happier with the awesome kindness they showed us. Kumar was our representative that aided us in not only getting a replacement but getting here in time for our guests arrival. The 4 stars is only because of the broken glass but you deserve 5 stars for setting everything right! The Rococo collection features a striking globe created by looping strands of royal-cut octagon crystals. Capping the web of brilliance is a scalloped glass dome and vase in an array of beautiful colors. Petite in size yet grand in appearance, Rococo hanging pendants are perfect for a spot of elegance in smaller areas. Available in Chrome Finish, Gold Finish, Purple Finish, and Red Finish. 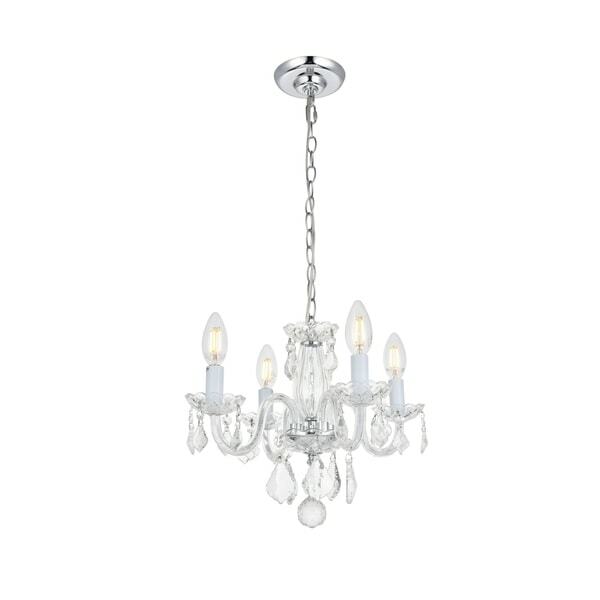 This Rococo Collection 4-Light Pendant with Royal Cut Crystals has a diameter of 15 inches and a height of 12 inches. Dimensions 15.0 In. X 12.0 In.